For third day running, police 'give Muslim rioters a prize,' close access to Jews. 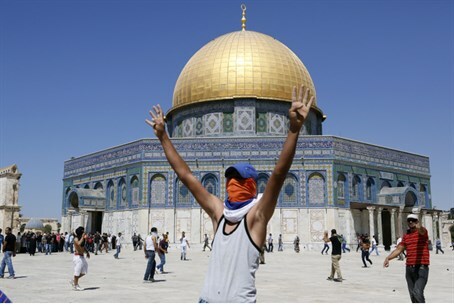 Muslims visitors to the Temple Mount formed a riotous mob on Tuesday on the inner side of the Mughrabi Gate, the only point of access for Jewish visitors, prompting Israeli police to submit to their violent outbursts and ban Jewish entry. The ban blocked Jews from visiting the holiest site in Judaism during the only hour in the afternoon when they are generally allowed access. The move follows police removing Jewish visitors on Sunday and Monday, also due to Muslim violence. On Sunday, Jewish visitors were removed from the site by police through the Chain Gate on the western side of the Temple Mount, after Muslim rioters threw stones and shoes at them from the Al-Aqsa Mosque. The script repeated itself on Monday, when police removed a Jewish group consisting of a groom and his entourage through the Gate of the Tribes, after Muslim visitors tried to corner them from different sides in a threatening manner. In the latest incident on Tuesday, Muslim rioters organized themselves in advance, with dozens of them marching to the only gate through which Jewish access is permitted by the Jordanian Waqf (Islamic trust) that administers the site in a de facto manner. Their march was under the declared intention of blocking Jews from visiting the Mount, in an act of revenge to the police for limiting entrance to Muslim visitors and allowing Jewish visitors on Shavuot eve last Tuesday, after receiving intelligence of planned violence by Islamists. Police banned Jews again on the Shavuot holiday itself, as Muslim rioters were witnessed on site. Yehuda Glick, head of the LIBA Movement for Freedom of Movement on the Temple Mount, condemned the police submission to Muslim violence. "Someone has to wake up before there's a tragedy. We can't give a prize to rioters. The barrage in recent days doesn't bode well; the government has to order the police to take serious preventative actions before this dangerous snowball explodes in all our faces," warned Glick.